There are basically two kinds of clocks; Traditional Black Forest clocks that are mechanically and quartz clocks (which are not mechanical). Both types of clocks are made by the same wood carvers and have some very ornate designs. The quartz clocks offer a great value and all the features of the traditional. The Cuckoo Clock originated in Black Forest, Germany, invented back in 1737. 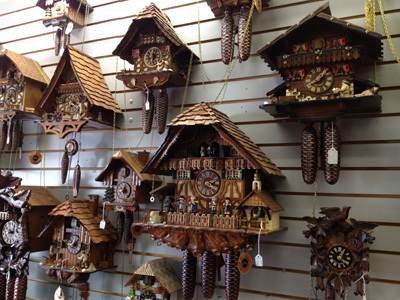 Made of deep shades of high quality wood, Guten Tag Haus’ cuckoo clocks are 100% authentic and extremely detailed. With scenes including details such as houses, trees, acorns, birds, leaves, and berries carved right into the wood, there are infinite varieties and you are sure to find a one of a kind clock for your home. 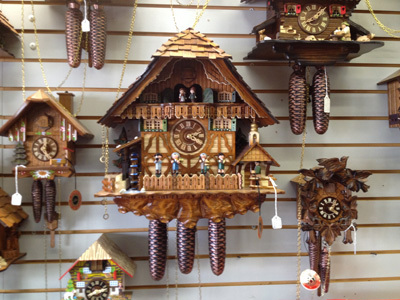 Each one has a cuckoo that pops out on the half hour, hour and many cuckoo clocks have dancers that spin, waterwheels, bell ringers, or other unique movement. Guten Tag Haus’ German cuckoo clocks are a fun and traditional way to not only keep time, but to decorate and personalize your home. The pendulum easily adjusts to the correct speed for the accurate time and the cuckoo sound and music are joyful time keepers as well as entertainment. Most of them have a night shut-off setting so you can sleep without the noise no matter what room the clock is in. Choose from mahogany, walnut, natural light, or antique oak for color and mount the clocks easily with a heavy duty nail on the wall. Find a piece you’ve never seen before from our ever evolving selection. Looking for a particular clock? Come in and browse our catalog. We can get it ordered and shipped directly to home for your convenience! Even if you find a clock in the store but don’t have a way to get it home, we will make sure to ship it directly to your home.